It’s an exciting moment when you’re offered a position within a company and they’d like to make it official by having you sign a contract of employment, but many people will forget that a contract is designed not only to benefit you but also to benefit the company. 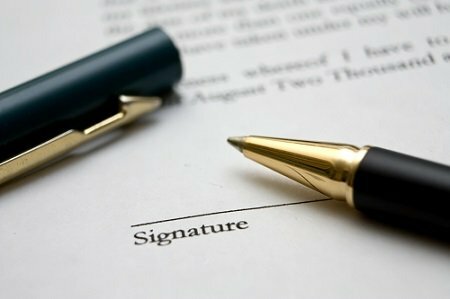 The fact that the contract binds you to the company is a reason as to why you should take a very close look at the contract that you have been given before you sign on the dotted line. One of the first things that you should take a look at before making a decision as to whether you’re going to sign the contract or not is whether your position within the company will be permanent. If the contract is only a temporary position you may wish to think twice before accepting the job as it means within just a few months you will have to begin looking for a job all over again. If you’re unsure as to whether the company plan to keep you or if the position is only temporary you can ask your interviewer or a senior member of staff. If a senior member of staff tells you that the position is permanent and you later find out that it’s temporary you can appeal. The economy is currently unpredictable and incredibly unstable; due to this a large portion of society has opted to work more than one job so that they can keep their homes and their families afloat. However, what if the contract you’re about to sign states that moonlighting is forbidden? That’s right; some companies will state within the contract of employment that you are not allowed to have more than one job, meaning that you cannot work for any other company and you cannot have any projects on the side. Your contract may also state that you aren’t allowed to work with a similar company or within the same industry for a set period after you leave the job. This means that by signing the contract you could make yourself unemployable once you decide to leave the company. One of the most important aspects of your contract is the section that describes the details of termination and how this can come about. It’s essential that you study the employer’s rules regarding termination and you make sure that these rules are fair. It’s also a good idea to find out how much notice you will be given before being terminated – if the notice is something similar to a week you could find that your contract is ended and you have just a week to find another job. As well as finding out how much notice the company will give you prior to termination, it’s also recommended that you investigate how much notice you will have to give to the employer prior to leaving. There are many other aspects of the contract that you should look at thoroughly; for more information on your rights concerning the contract of employment you can get in touch with us here at Access2Barristers Direct.